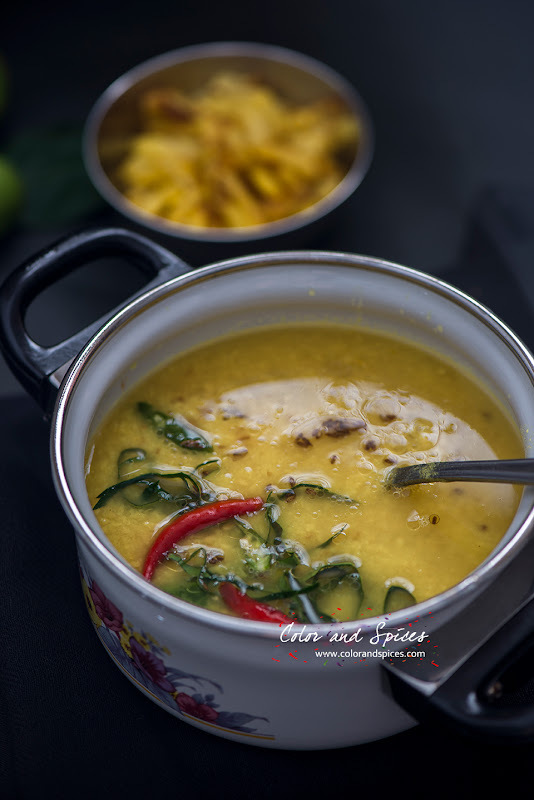 Yesterday I prepared a simple dal for lunch, a typical Bengali lentil soup, but something that turned it special. 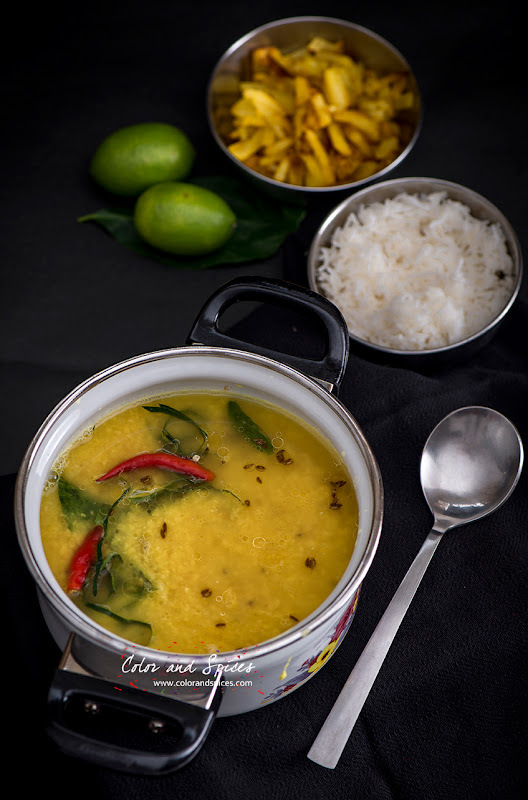 The dal was flavored with the leaves of Gondhoraaj lebu. Gondhoraaj literally means king of aroma and it is native to Bengal. These are somewhat similar to kaffir lime. From a welcome drink to main course to desserts, these elongated thick skinned large limes work wonder. 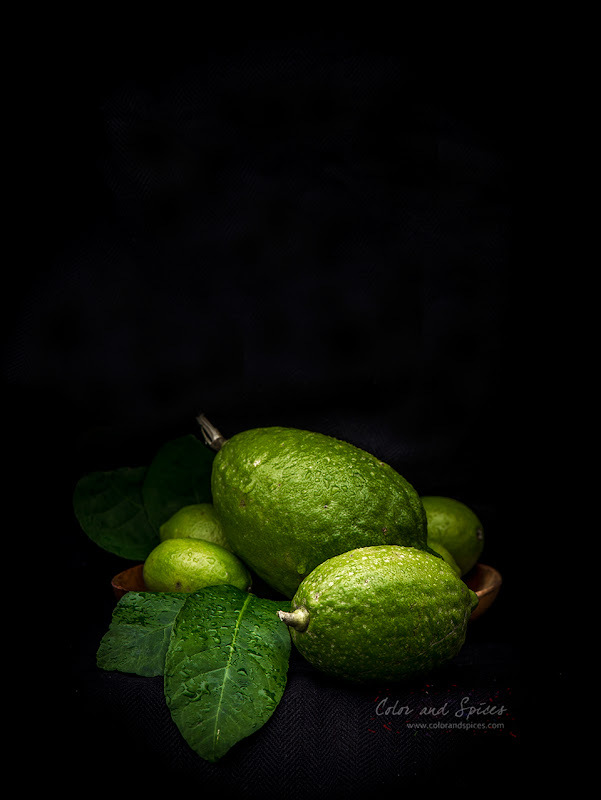 Usually these limes are cut lengthwise into wedges and served along with Bengali meals, either a simple dal or a spicy bowl of mutton curry, it uplifts every single dish. I remember during my stay outside India how I used to crave for these fragrant limes. I know people who wouldn't mind to drive three hours to buy some 'Gondhoraaj lebu'. 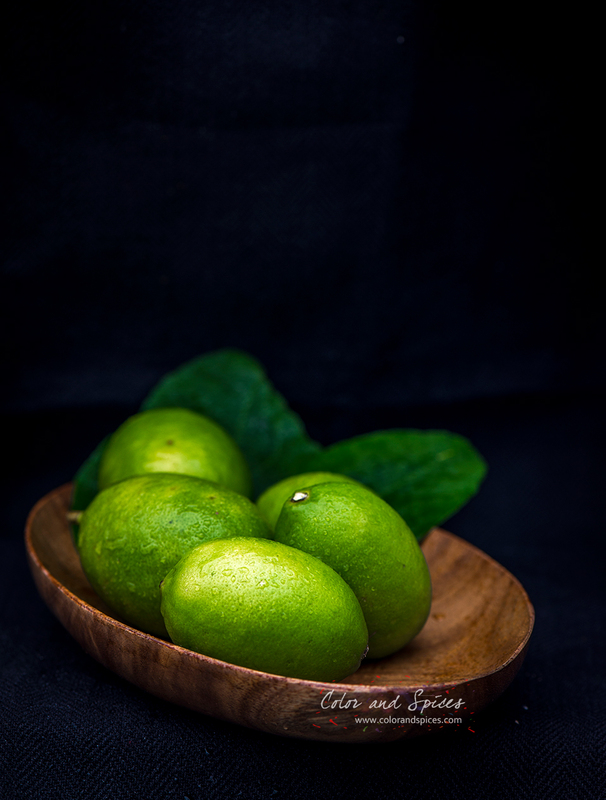 Now that may sound eccentric but once you experience the aroma of these limes, and know how it can transform your simple food you will see the justification. Luckily I do not need to drive miles to get them. Whenever I visit to my in-laws I bring back a bagful of those bounties along with some leaves, which are equally fragrant and can be used in various dishes. Homegrown ingredients are bliss. And specially when it's something exotic like 'Gondhoraaj lebu' then you can't help to take out the camera to click few pics before enjoying them with your meal. At my in-laws place two different varieties of limes are grown, one is large thick and rough skinned, and the other ones are smaller, smooth skinned, both are packed with heavenly aroma. I made a dal or lentil soup, and added the leaves to the dal. 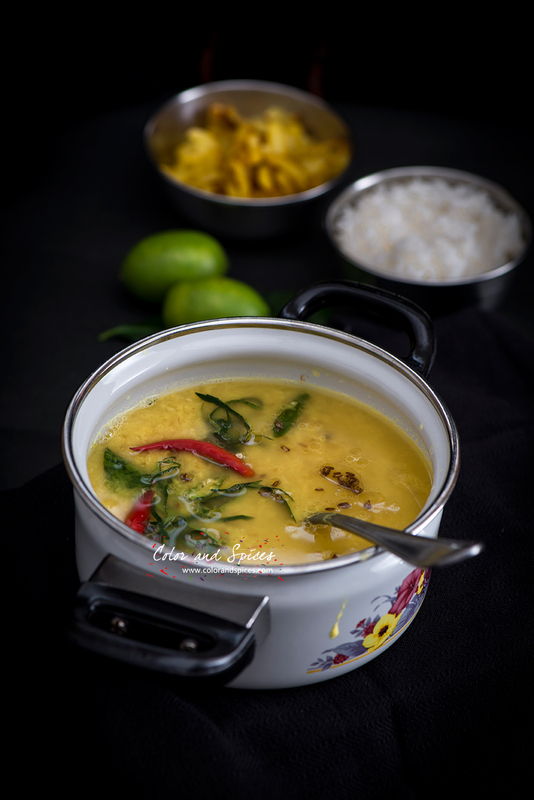 This dish is called 'Lebu pata diye dal' or lentil with lime leaves, a very common dish in any Bengali household, specially during summer. The flavor of the lime leaves has a cooling and refreshing effect. I used skinned mung dal for this. 1. Dry roast the lentils in a heavy bottom pan, till the lentils start to change color, take care not to burn them. Wash the roasted lentils till water runs clear. 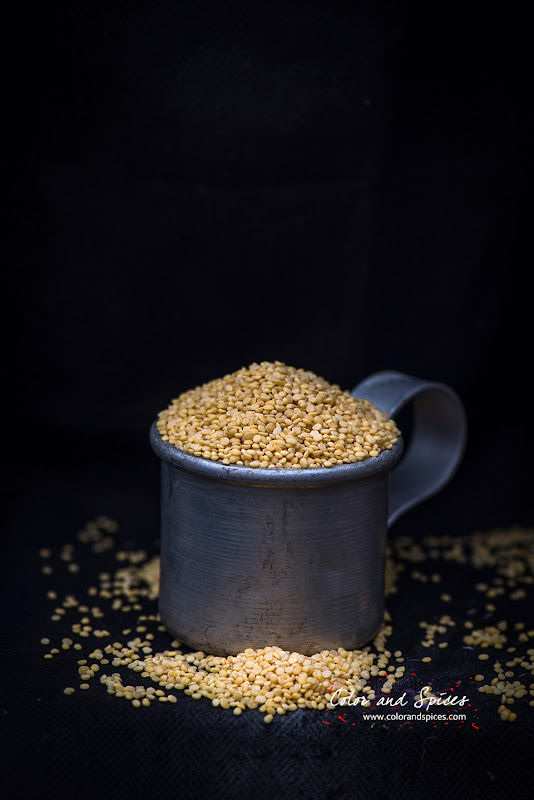 Cook the lentils, a pressure cooker can be used. 2. In a pan or wok heat oil and ghee, when hot add cumin seeds and let it change color to brown. Add green chilies, chopped ginger, cooked lentil and turmeric powder. Add the lime leaves. Leaves can be cut into thin strips or just roughly torn by hand. Add salt and sugar as per taste. Let it boil. Reduce heat and cook for 2-3 min. Switch off heat add lime juice. Serve with steamed rice. Thank you Nabanita. It's an honor to be someone's inspiration. Thai red curry noodle soup..